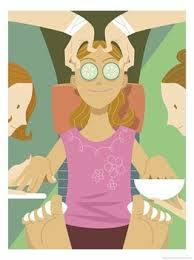 Pampering while frugal…how do you do it? I have to admit, I’m not very good at pampering myself. I never really was even before I had sonny boy. My Father had to yell at me to sometimes spend some money on myself and treat myself with more than just a new pair of shoes(my vice). Now my Husband has taken over that role and does genuinely get upset with me for taking care of everyone but myself. I did go through a spell of “princess mode” for about a year when I was modeling full time, but the guilt definitely crept in, and I discontinued all that pampering as soon as I could. But, isn’t that the plight that all Moms face? That’s just part of having a family, right? Well, wrong, according to EVERYONE I talk to. Now, here’s the question: how do we do this on a budget? I have actually been pretty good at figuring out how to “pamper” myself without spending an arm and a leg. I’ve also been lucky enough to get gifts from family that helps with this. A lovely foot spa, an at-home facial machine and lots and lots of designer lotions and bath products. And now, thanks to my new love of CVS and receiving free items from them, I have lots of luxury items to choose from. But, being the constant giver that I am, I’ve been using all the best stuff for gifts for others. Hey, you can’t build Rome in a day. My biggest issue is my hair. Because of the texture of it, I really should go to a stylist once every 6 to 8 weeks, but that just ain’t in the budget. I do a so-so job of keeping it up myself, but sometimes I have to just bite the bullet and spend the money to get it taken care of. I even had my stylist cut most of it off last time because I knew that I couldn’t keep it up if it was longer. Its been (gasp) 6 months since the last time I’ve been to my stylist and I am preparing for the spanking he’s going to give me about my hair. It is quite the birds nest, but thank God for hair clips lol. In my family, we have the genes of great nails so I don’t have to do much to them to get them to grow, and boy do they grow. I used to be stupid enough to put acrylic tips on them and spend 20 bucks every 2 weeks just to get them re-done. I think about that money wasted now and I could just cry. All that to make my nails look like what they end up being WITHOUT tips in 2 to 3 weeks. Live and Learn, I guess. So, how about you all? Any tips on how to stay luxurious on pennies? I shudder to think how much this hair appointment is going to cost us…..